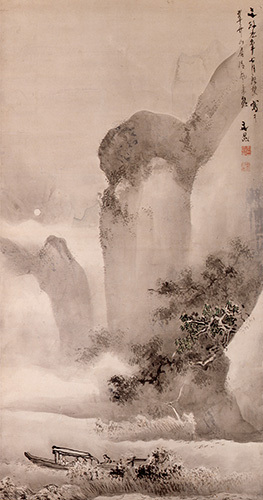 A subtle and profound landscape by an Edo period master envisaged from a Chinese poem. Buncho Tani was in his later years when he painted this picture in 1826 (Bunsei 9). He was already displaying a huge influence as an outstanding figure in the literati painting school of the Kanto region. The landscape paintings by Buncho in the Bunka-Bunsei era (1804-1830) are characterized by an attitude to place emphasis on old paintings, a realistic tendency coming from an interest in representation of real sceneries, and expressions typical of ink painting brimming with vapor. The influence of masters of Chinese ink painting such as Xia Gui and Yu-jian can also be identified in this painting. It even demonstrates the level of representation of nature beyond sketching achieved in those days.